For those without comedic tastes, the so-called experts at Wikipedia think they have an article about Alain Robbe-Grillet. 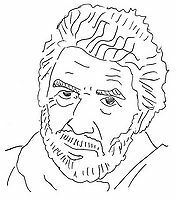 Tracing of a photo of Alain Robbe-Grillet, thereby avoiding copyright issues as well as being terribly postmodern and clever. Alain Robbe-Grillet, often known simply as A., may or may not be a French novelist, or possibly several French novelists, or one with many identities, each masquerading in the guise of A. He is known principally for his New Romantic novels or nouveau romans, a style which he developed in conjunction with his friends Clod Simenon, Marguerite Durex, Nathalie Seau-Watt and Michel Buthole. Besides his successful writing career, he has also tried his hand at film-making, with far less success. The most consistent elements of A. 's novels are romantic sentimentalism and anthropomorphism (hence the popular theory that he is the true author of Watership Down), together with a warm and compassionate humanism, and a certain attraction to the older woman (bordering on gerontophilia) - all of which have drawn him sharp criticism from certain quarters. His lifelong enemy Roland Barthes claimed one of A's books contained absolutely zero literature (le degré zéro de l'écriture). In a characteristically robust response, A. called him a jealous old queen and punched him in the face. When Barthes came back with a knockout right hook, A. went down, apparently Dead. Thereafter, Barthes declared him to be a dead author, even writing a book about it in 1967 - before realising that this A., the one in the Fedora hat, was not the A. who had started the argument, the one with the moustache, but indeed may have been B. in disguise, or possibly the man in the train, who may also have been C. - the man whose double-reflection in the carriage window haunts him on the journey he may or may not have made previously as a child. Whilst Barthes was picking apart the semiotics of this confusion, Robbe-Grillet, using the literary device of prolepsis (or prolapse), stole a laundry truck from the year 1980 and ran him over, with fatal consequences - thus settling the argument once and for all. In the 1960s, recognising the deplorable state of his local cinema building, and realising (way ahead of his time) the value of Hollywood-style multiplexes, A. decided it was time for a fund-raiser. His initial idea was to auction off a set of family snapshots; however he ran out of pictures long before sufficient money was raised. Instead, he decided to make a film; that way he could auction off each frame individually. Hoping to make his film a commercial success, A. recruited experienced Hollywood blockbuster director Alain Resnais. Employing a classic New Romantic story, boasting all the elements that made A. 's novels so popular, it is uncertain why A Nose Around Marienbad (le nez derriere a Marienbad) turned out to be such a critical and commercial flop. It cannot have helped that actors Delphine Seyrig and Giorgio Albertazzi spent the whole shoot high on drugs; not only did they keep forgetting their lines, they could not actually agree on whether or not their characters were supposed to have met at Marienbad the previous year - which, as it turned out, was a crucial element of the plot. Even the unexpected discovery of a formal garden, often useful in such a situation, couldn't help them resolve their dispute. All this confused not only the actors, but also the viewers, who consequently stayed away in droves. This page was last edited on 27 June 2012, at 06:41.